... Bobby Brown & Whitney Houston divorced. ... & I STARTED BLOGGING!!! I can't believe it has been 10 years TODAY. A full decade. Wow... where does the time go. This is my first time blogging! I'm excited because I have an idea to show how my life goes. I am going to take pictures of things I see every day that I think are beautiful or amazing. I want to look back and see what draws my attention. A lot of it will be my knitting because it amazes me that 2 sticks (sometimes more) and a string of yarn can make something beautiful. It's funny because I actually started this blog because I wanted to document my knitting. Hence the name, Knit by God's Hand. I thought it was a good way to acknowledge my knitting, but also my love of Jesus. I also had the line that went with my blog name that said, "The Bible doesn't use the word KNIT for just any reason"... I have been corny since the beginning apparently. But man, doing this for so long & seeing my own blog, I've seen so many changes happen over the years. I have seen so many people who are big bloggers - great bloggers. I get so invested in their lives & their story telling & then they just slowly disappear. I am always so sad when that happens. I really tend to see that when people have babies. (Dont be scared new moms out there) I know life takes on a busier lifestyle & blogging gets pushed to the side - totally makes sense. But I know I love seeing blog friends, especially ones who have wished & prayed for a baby for so long, its so exciting for me to see them go through the pregnancy journey... & I get so sad when blogging slows down after that. Back in the day (I'll probably say that a lot here in this post - its well earned) there was no Instagram - Facebook wasn't even that popular & if you "Tweeted" you'd probably have to say "Excuse me" right after. There was no other place to connect other than Blog World. I have to say, even when people stop blogging now, it is nice to connect with them on Instagram & Facebook & Twitter. You see life as its happening & in a whole other format through those outlets. I am a picture person by nature anyways so I adore Instagram & love reading all the descriptions. Its like a mini-blog to me. So if you ever stop blogging, make sure you still Instagram or Tweet so I can make sure you're doing OK. Please... I worry. Over 10 years, I have to say, I have developed some real, sincere, true friendships. It really is amazing how you can connect with certain people via blogs, just like real life. Those people that you are drawn to because you can tell they are honest & true. & the emails become more frequent & the personal messages on Facebook go into a text & then you may actually talk on the phone & you send packages & mail to each other to surprise someone. & you rely on their prayers when you are in need, & you text through shows like Dancing with the Stars & Big Brother & Survivor - basically any reality show you want to laugh with someone about, & you check in on their family - including their dogs - & you talk about what book they are reading & on & on & on... it just become a true friendship. Blogging actually does that. It's amazing really. I wouldn't trade these past 10 years just for that reason alone. I love my blog friends something fierce. My family thinks nothing of the statement out of my mouth, "Yeah, my blog friend...." when that's a normal sentence in your world? You know you have gotten to this level. Anyone else remember Google Reader? There was no other way to stay on top of blogs that posted new posts. Unless you put them on the side of your blog under a "RollCall" sort of list. When Google said they were taking their Reader down - I remember the panic that ensued. Funny how you think there's never going to be anything that can take its place. A life lesson in that. Thank you Bloglovin' for stepping up. This was something that seemed really big awhile back - I never understood it. & I'm not hacking on anyone that did it, still does it, or sponsored blogs. But apparently, you'd pay another blogger a fee to be 'featured' on their blog & for them to carry your "Blog Button". That always was strange to me. Obviously, I never jumped on that bandwagon. I dont see as many posts like this anymore. Those sort of posts not only kept me away from the person paying to be featured, it usually turned me away from the blog that charged other bloggers a fee to be featured. That to me isn't what a real blog relationship is about. Now... granted... I do love a shout out from bloggers about another blogger. I have found some of my favorite blogs that way - but to charge them? ... um... no...Not for me. I think my biggest issue with blogging now is it seems like those real life posts are fewer to find. I see so many sponsored posts. & again, if you do that, no offense. It's the way blogging has turned for the most part. I for one have never stepped on that train. Mainly because I feel like seeing the back side of blogging, where I have been contacted to do sponsored posts, I feel like even if they ask for an 'honest opinion' - its hard to really give a negative post if someone is paying you or giving you a product - at least for me. I know I do review books (because girlfriend ain't ever gonna turn down a free book) & I have felt HORRIBLE when I dont like the book. I can't imagine how I'd feel if someone gave me a bunch of products or was a big name brand & I didn't like the thing. I just miss real life. 10 years ago, that's all the blogs were about. How life was going. How their families were doing. How happy/sad/frustrated/angry/excited the blogger was about their own life. How their house was decorated. How they were celebrating the holidays. How their dog looked riding in the car. Just real life. Now? Things are just so fast. Its like things are broken out in fast reads. I just think that a lot of people don't take the time to want to read long posts... like this post right here. Half the readers probably already checked out 3 paragraphs before. We live in a world of 140 characters & then move on to the next thing. I think the blogging world has turned that way a bit... & it kind of makes me sad. I miss the real life posts. And I actually do still follow some amazing blogs that tell about their life & share how they feel about things & just post whatever they want. There are some out there - & those are my favorites. If I comment on your blog daily - you are probably one of those blogs to me. Keep doing what you're doing. Keep being real. I just told my blogging friend Ashten that we need to turn the tides of blogging. Bring real life back again. Share more. Goodness knows we all share on the social media outlets. Why not share in a place where you can really make it your own? Another big change I've seen are these amazing blogs that look like something out of a magazine or something that is worthy of a Pinterest pin. GORGEOUS pictures. Beautiful photos of their dinner or their kitchen & home or how they made their food. Or stunning pictures of their make up, or these gorgeous lighted pictures of books. I love looking at them, but again - THE PRESSURE. I can't keep up. & I'm a photographer. The irony of that is not lost on me. Again, I'm all about real life. If my cell phone doesnt take a grainy picture & its sort of in focus, I consider it a blog win!! That used to be a bigger thing than it is now too. Now, its just flat out a full production. Vlogging used to be where you'd sit up a camera & talk instead of write. & they'd be that same grainy look I was telling you about. Now? You need a full set up with camera, lighting & editing software to do a video for your blog. I do good to do a 10 second Instagram story. I do love videos - seeing people in motion - hearing real voices. But man, I'm not sure "vlogging" even exists anymore. Now, its all about getting followers on YouTube & production levels are vastly different than before. ... no hate from me about it - I love watching the videos. Its just that I think the term "Vlogging" is a past thing now. I know blogging has changed in the past 10 years. Heck, I've changed in the past 10 years. My grey wasn't as thick. My knees didn't hurt as bad. I wasn't a grandmother 10 years ago & now I have 3 grandsons & 2 Grandbuddies. My best friend was still alive & living down the street from me. Wow... just thought of that. My grandfather was alive. My brother in law was still alive. Sydney & Buffy were still around. (how I miss my girls) I had visions & dreams that were totally different for my life now. I hadn't shot my first 'real' photo session. I had never ran in my life & never dreamed I'd do a half marathon, much less quite a few of them!!! ... but I did still love Beauty & the Beast, Steven Curtis Chapman AND knitting. Life changes... so does blogging. I'm sure it'll evolve again as everything else does... & like everything else, some things work for me & some don't. I just want to stay true to who I am. I want to keep my memories around so I can look back one day & read a post & say, I remember when that happened. That to me is what blogging is about. Sharing life. Letting others share it with you. Making friends along the way. Encouraging others & being encouraged. What is the best thing / worst thing about blogging to you? What do you wish there was more of in the blog world? Wow, I love this post and I have SO much to say but I don't want to leave a mile long comment..lol so I guess I'll just save it for when we talk in person someday! I had no idea what was in store for us when we started blogging and I definitely did not expect to make friends. When I talk about my friends now, my husband always asks me "are these real friends that you've actually met"? He's always so worried! Happy 10 years and I'm glad you kept it going for so long! And I read all the way through, I did not check out! happy blogaversary! ha, i guess we're the old timers of blogging...i was blogging BEFORE the inception of Blogger or any of the blogging platforms we have today!!! back then, it was called an "online journal" LOL. Happy Blogiversary!!!! TEN YEARS! That's awesome! I love your recap of the past 10 years- I feel like you've seen so much change and grow in the blog world! I love coming here and reading your blog- can't wait for +10 more years! Happy Happy 10 YEARS!!!! That is so amazing and such an inspiration! Think of how many memories you have documented here - that's so special. And I agree, lets bring back more of the real life blogs! Wow! 10 years. That is so awesome. Congratulations! I love reading your blog and I talk to my hubby about you all the time. One of these days we need to meet in real life. Hope you keep on blogging and bd never quit. Lord willing, I'll be back to it soon too. Happy Blogiversary! I've been blogging for 10 years, too! There aren't many of us that are still around! Have a great Tuesday! The internet ate my comment. But CONGRATS. 10 years is a BFD. Strangely enough, I love reading about peoples lives. While I search the internet for recipes, that's not ever something I'll really read, other than to get the ingredients I need. These are the blogs I read because they tell me something and I can connect to people. Wow, 10 years! That's impressive. I love how genuine you seem in your posts :) You're definitely keeping the realness alive with your blog. That's what blogging is to me too - an outlet, a hobby, a place for my thoughts. I think that's why I'm still doing it - no pressure! i didn't check out :) i read it. haha. but you are right, people definitely do check out and don't read long posts, as i'm sure you see in comments when people leave random things and you're just like i know you didn't even read it! i mean, whatever but bugger off lol. i don't mind if people stop blogging as long as i can stalk them other ways like instagram and stuff like you said. i like real life posts as well, i'm happy to read sponsored posts every now and again but when that's all there is, i forget who the person is and i can't connect with them. i don't want this to be my job or career, kudos to those who do but it's not for me. happy 10 years! RIP Steve Irwin. The truth is, I miss how it used to be too. Now it seems that almost everyone is in it to make some money, and for me, that did used to be a dream of mine as well...until a few years ago. And the reasons that I stopped trying to pursue blogging as a source of income were many, but they were largely because, as selfish as it will sound, I wanted my blog to ultimately be largely about me and my life and my thoughts. I didn't want to have to worry about if what I was posting would grab enough readers through a Google search or if my images were going to get pinned or even have to worry if I didn't post a certain number of times that week. I wanted my blog to just document my life so that when I get the inclination to look back (which I do, about every 3-4 months), I have a way to access my past thoughts and experiences with the click of a mouse. Anyway, I'm so glad I've found your blog, and it's always fun to find an online friend who sees life very similarly to how I do. I was devastated when Google Reader went down. DEVASTATED. I still don't think Bloglovin' compares. So much has changed in the blogging world, even in the 5 years I've been doing it. And love your plea to those who quit to stay in touch via Twitter or IG. It's always sad to lose touch with a blogger you connect with. Great post! It's so true I've watched some big names come and go. I've fallen off several times with the kids but it's been fun to see it change from the kids to baking and really finding some creativity. Best thing is meeting great people / I really haven't found a bad thing about blogging. I wish more of us could get together instead of having to pay a crap load to go to conferences or being sponsored. OR the ppl that don't tell honest reviews just say a nice thing since they were given free stuff. Happy 10 years!!! Blogging really has changed in the last two years and I liked it better before. I miss all the real life posts and just being yourself. I try to share the every day snippets of my life because that is what I like to read. Sure, I like the recipes and product recommendations and stuff....as long as they come from a place of ingenuity. I get tired of opening my feed and seeing nothing but sponsored posts. It is great that some people are making money of their blogs, but its not what I want to read every single day. And I have noticed that some of the blogs that I used to really enjoy 3 or 4 years ago got really big and then disappeared. I feel like they got a little too big too fast and felt the pressure and weren't there for fun anymore and that is why they are gone and I never want that to happen to me. Blogging is my favorite hobby and I have made a few real life friends from it, and so many internet friends from it so I am thankful for that. I need somewhere to write and don't plan to quit anytime soon, that is for sure! Happy 10 year Blogiversary! I for one am glad you are here and that we have "met." 10 years is amazing. That's a SUPER long time in the world of blogging. Congrats! I just celebrated 7 years. I always feel sad when bloggers drop away too so I'm glad you're still blogging! I am ALWAYS saying "my blog friend..." Love the blog friends just like in real life friends! I try hard to find only "real" blogs. I love your honesty and how genuine you are! I try to keep it real too and blog about the hard things too. Not into the blogs who portray life as always being perfect because it isn't. That is such an incredible accomplishment! PS Sexyback is REALLY 10 years old?! Happy blogiversary!! I started blogging in 2007 on Yahoo360. When that closed, I moved to Multiply. When that one closed, I moved to Blogger! Sure hope Blogger doesn't close! I've lost quite a few bloggers, especially when Multiply closed. It really is sad when that happens. I agree with you that friendships really are legit and meaningful here! I LOVE meeting my blogging friends in person and most everyday I say "...my blogging friend.." something. I have no interest in making money from blogging either, or posting links to make money. This is about friendship for me, and documenting my life. So happy we connected!! I can't believe that you have been blogging for 10 years now. So much has changed in that time. I love meeting bloggers in real life. I haven't done it much, but when I travel for work, I try to meet bloggers if they are around there. I love the blogging community mostly. Some parts are tough. I hate fully sponsored blogs. I don't mind seeing a post every so often, but not weekly or more than that. I love real life blogging. That is what I do because it is what I like to read. I've been blogging for around that long too! Congrats, btw! OH goodness I remember all of these! I've been sort of blogging for 6 years, the first few were just for my family, and I loved clicking on that little blogger "next blog" button and discovering new and wonderful blogs! Happy Blogiversary!! Such a great post...I love the connection with people, the encouragement, the advice, the support, and many many times i have been inspired by things blog friends have shared or said to me in a comment. It is something to think back about 10 years and how things in life have changed. I often find myself chuckling, or nodding my head, and feeling inspired by the things you share :) You are a very gifted writer/storyteller, i am intrigued by your ability to say things with such grace. Happy Blogiversary! :) And woah are those time facts from ten years ago crazy to think about! I've been at this for about 8 years & I have totally lost my mojo. Sigh. Happy 10 years!! I rarely see anyone last that long. I know exactly what you mean about when bloggers quit, I hate not knowing what's happening in their life anymore. Thank you for commenting on my little ole boring blog, that means the world to me. I really miss the "real life" posts. Blogging used to be like having an online journal, but now people try to become a "brand" and use it as their side job. Sad. I actually AVOID buying certain products because I am sick of reading the sponsored posts. I also get tired of seeing "look at this stuff that I want to buy" posts. 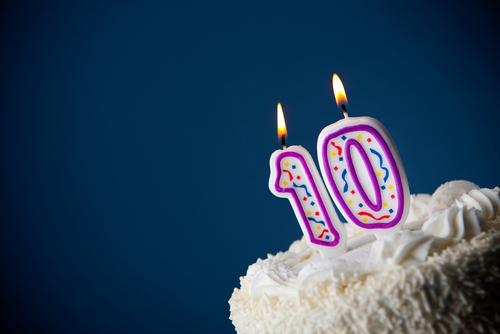 What a fantastic post honoring your 10 years of blogging. I agree with you. I'm all about real, authentic people. Happy blogiversary! Happy 10th anniversary! I loved this look back at blogging. It made me realize how much I've slipped from the blogging world--posting my own and reading others. My excuse is also real life--too much living it and not enough time to blog about it. I miss it though. Congratulations on 10 years of blogging-- what a fun way to look back over the years. I love the meaning behind your blog name and that you kept it with you this entire time.